Do you hear that? That is the sound of a quiet house; the sound of a uninterrupted cup of coffee; the sound of my thoughts echoing in my head… I can actually hear myself think! It is the sound of my sanity returning. You see, it is the first day back at school for the kiddos, and I am enjoying the absence of activity, the lack of “Mom, I’m bored” and not hearing children’s shows on the television. Please don’t misunderstand, I LOVE my kids, and I love having them at home, I just also appreciate the time I get away from them. The last four days of their vacation were pushing the limits of my sanity. Liam, my wonderful boy, who used to play fairly well on his own, seems to have unlearned that skill since starting kindergarten. Something I did not plan for during this vacation! In the last four days, I’m pretty sure he averaged ten minutes between “I need someone to play with” or “Don’t you want to play with me?” or “I’m bored”. So, I’m sitting here, enjoying my first cup of coffee all by myself, and the wheels are already spinning for the next school vacation, and how to weather that one with a little less chaos. As I was walking home after dropping Liam off at school I was mulling this over. Spring Break is still a few months away, but I don’t want to be unprepared, and obviously I need to do something so that he’s not bored. I’m not too worried about the Spring Break, as it’s only a week long, but I thought it would be a good time to test things out in preparation for the much longer summer break. I came to a few conclusions. The first being that one week seems to be fine for him, it’s the second week that starts wearing on all of us. Next, I think I understand a little more of why he wasn’t playing so well on his own. Since starting school he’s become used to someone else telling him what to do and when. At home we’re a little more relaxed, a little more unstructured. So, how do I fix this? If you follow on Pinterest, you might have noticed that I started a new board this morning: “Keeping the Kids Busy”. I’m gathering up ideas for keeping the kids busy during the vacation times. Not busy with chores, but activities they’ll find fun. Mostly, this is for Liam, our Teen doesn’t really need the help, but I like to try to find things that I think will appeal to him as well. It allows our boys time to have brother time, and I’ll be honest, when they’re having brother time, Mommy is taking full advantage by catching up on housework or other stuff. Having ideas is all fine and dandy, but we all know how Pinterest can help you waste invest hours of your time looking at useful ideas, but that doesn’t always translate into doing what you’ve pinned. And it’s not always a case of pop on to check your board for an idea and then do it. Supplies are usually needed, and while many times we have most of what we need, we may not always have everything we need. What’s a scattered brained mom to do? This is the section of my HMB that houses all things kid related. Inside this section are two subsections, one for Liam and one for our Teen. For the most part, this section is working great. 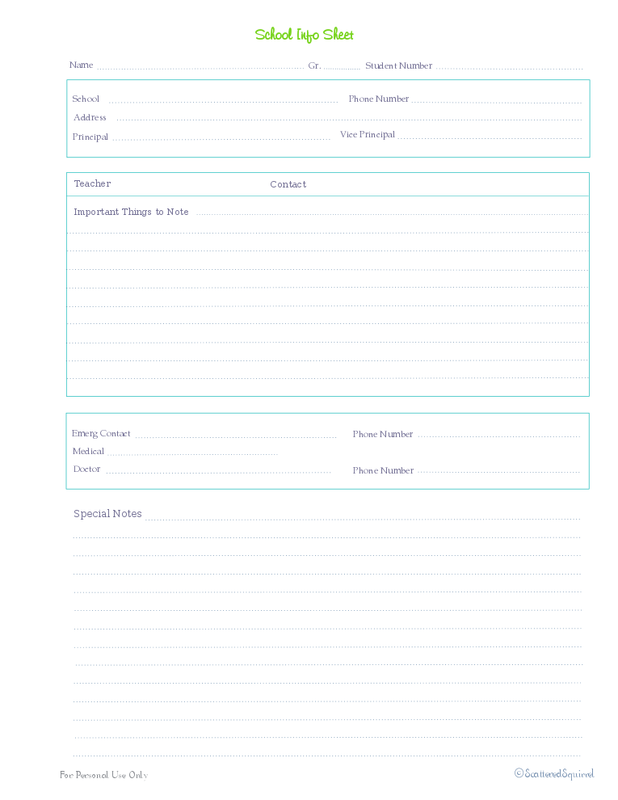 Each of the personal sections contain important school information, like handbooks, copies of some of the forms, especially ones like the permission to use the internet. I kept a copy of these because they’re more like a contract or an agreement rather than a permission slip. I feel it’s always a good idea to keep copies of stuff like that, just in case there is an issue down the road. Along with the important school forms, I have the following printables (which I made last year) Click on the pictures to snag a copy of your own. 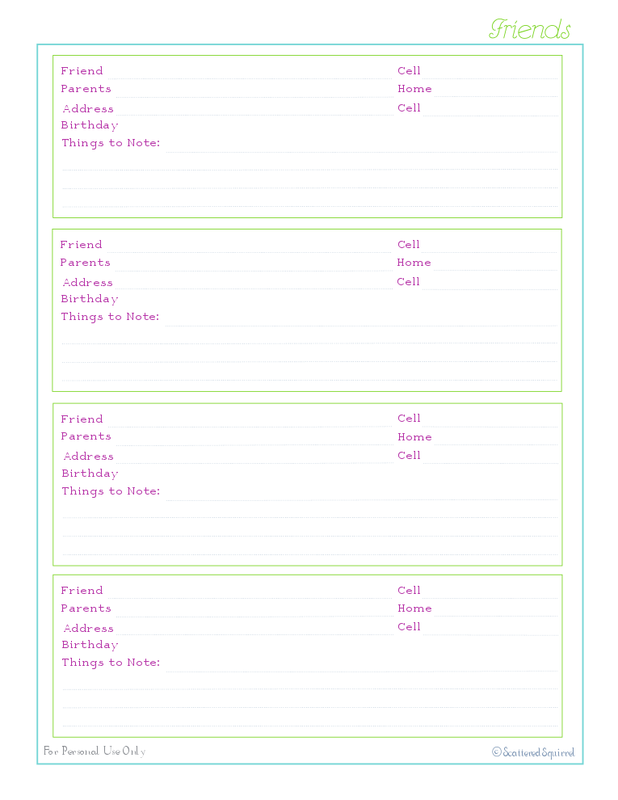 You can check out the original post for these printables here. But none of those printables are really going to help with boredom. Well, maybe the friends list, because it’s always better to be bored with a friend right? I kid! For days when playing with friends aren’t an option, when the computer holds no appeal, and the kids (and by kids, for myself, I mean mainly Liam) are sort of at loose ends, having a point of reference for ideas is always a good thing. So to help me keep those ideas close at hand I created a simple list. See what I mean? Really simple! A place for the name, and check boxes for “Tried” and “Repeat”. Those are just a way for me to see what we’ve done already and whether or not it’s something we had fun with and want to do again. The nice thing about keeping it simple with a list, is that it can grow, expand, change, and it means I don’t have to fire up the computer and hunt up ideas. I think the list will also help challenge me to put my own spin on ideas, and maybe help us come up with our own fun activities. So, I make a list, great! But how do I know I have what I need on hand, and what I need to pick up? Well, to go with the simple list, I made … well, another simple list. This one is super simple too! I can keep a running list of supplies needed for the activities. 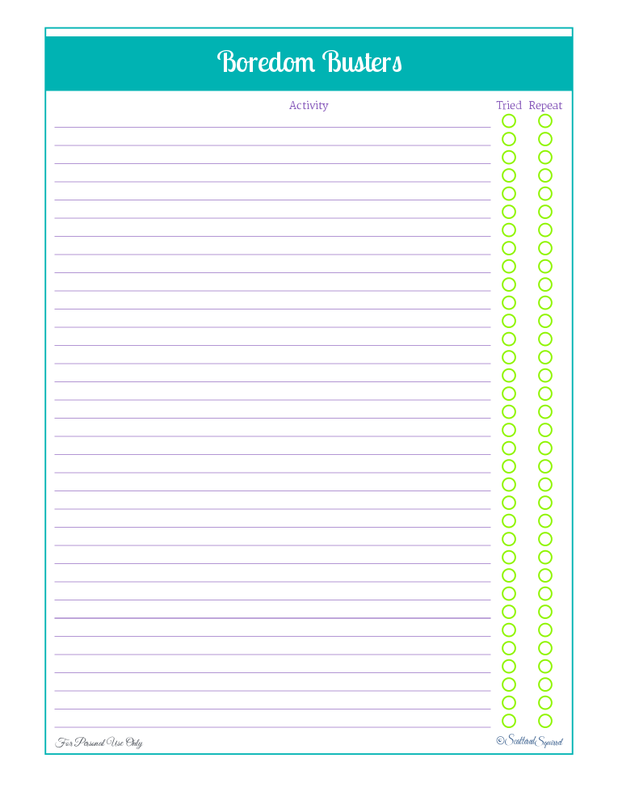 When I add a new activity to the list I can add the supplies to our supply list. When we head out to do the shopping, I can bring the list with me, or just jot down a few items on it and pick them up a little at a time. I tucked it into a page protector so I can also use the list as an inventory. An item comes in, the box gets checked. We run out of an item, the box gets unchecked. I’m also working on a few ideas for how to store the items, because I want to keep them separate from our normal toys and craft supplies. I’m not too sure how that’s going to work, but I’m pondering it. For the time being, that pretty much sums up the Kid’s Section of my HMB. I’m sure there are other things I could include, but I’m not sure what. If there a printable you were hoping to see in this section but I didn’t make one, let me know, I’ll add to the Reader Request list! What about you? Do you have any tips for helping beat boredom during school vacations? 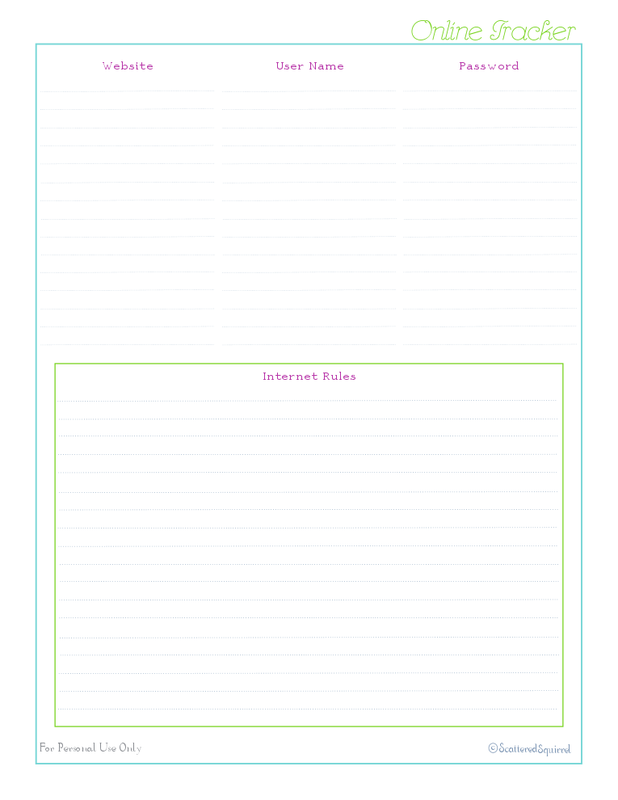 What sort of info do you store in your Home Management Binder for your kids? Do you find yourself reveling in the peace and quiet when school is back in session after a break?